is ready to travel anywhere. and dropped in my aqua pot. because I adore you all a lot. it was, ‘Quarter Acre Lifestyle’ !! Wendy & Roger are Kiwi’s, living the “Good Life” frugally on a quarter acre parcel of land in New Zealand. Quarter Acre Lifestyle is their WordPress Blog and Tumble Downs is their on-line shop offering handmade natural soaps, dog sitting and at times, arts and crafts made by them. 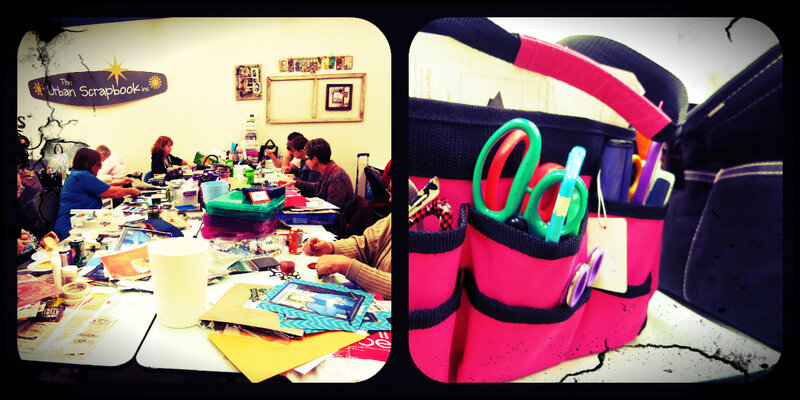 Crafts, gardening and doggies! Certainly sounds like the “Good-Life” to me. I’m looking forward to getting to know them better. Congratulation’s Wendy and Roger, please contact me here Boomdeeadda@gmail.com to arrange mailing! As I’ve bragged about often, I have the best job ever ! Working at Urban Scrapbook is always fun and inspiring. This past Saturday we had a Halloween Crop. To all you non-scrapbook folk, it’s where a whole bunch of creative people come get together to craft, gab, eat a yummy meal and win prizes! Some of you may already know, I dressed as Amy Farrah Fowler. 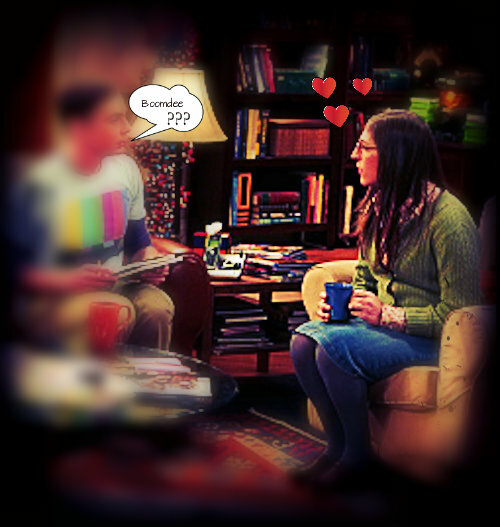 “She’s a girl, she’s a friend, but not a girlfriend” is how Sheldon would describe her on my favourite TV show, The Big Bang. I wore the jean skirt, nasty green sweater, icky tights and flat sensible shoes. Of course there was the trademark barets and purse too…hehehe. I even bought some drugstore glasses that seemed Amyish. 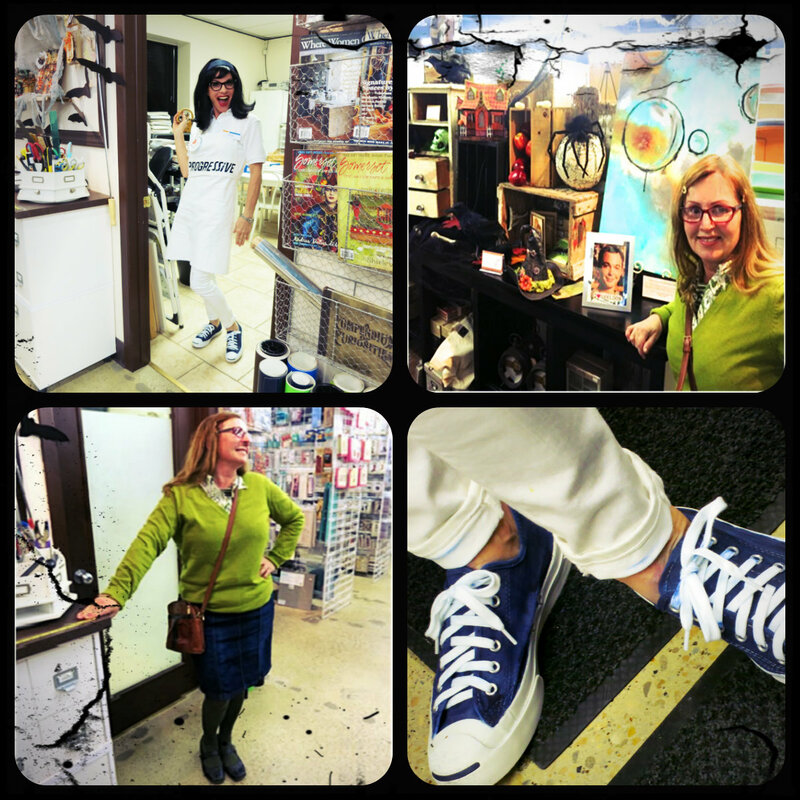 Then, one of the fab owners of the shop, Lori, dressed as Flo the Progressive Insurance lady. Lori even dyed her converse sneakers to match! Hmmmmm, remind you of anybody? Oh! Guess how many kids we got at our new house? We figure it was around 150. We went out for more candy twice. That’s sure a change from our home in the country where we’d get maybe 6 kids on a busy year, LOL. So until next year, all you Halloween enthusiasts stay creepy. Looks like it was another successful year of monsters, haunters and winners. Did you hand out more treats than you ate? 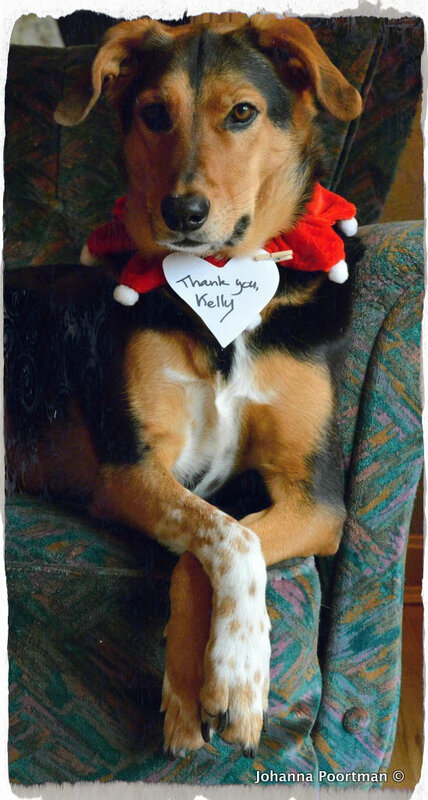 “hand out treats”………..what does that mean? Were we supposed to give all that candy away? Ooopsy. Ooopsy is right! HA! Do you buy stuff you like too? That is a fatal error for deciding what treat to hand out. I don’t dare buy liquorice because there’d be none left by Halloween. I tend to stick to things that are safe from my snack attacks late at night. You looked great as Amy Farrah Fowler! I hope you acted the part as well! That spooky house is amazing! LOL, thank you my friend. Honestly, we were so, so busy in the shop that night, I didn’t even have time to think about my Amy-ness. I did have a framed picture of Sheldon at the Cash Register that I gave to a member to pass along to her niece who also loves the show though. HA! Your Amy Farrah Fowler costume was perfect! You looked great and it sounds like you had a blast! I’m so glad you had so many children come calling. 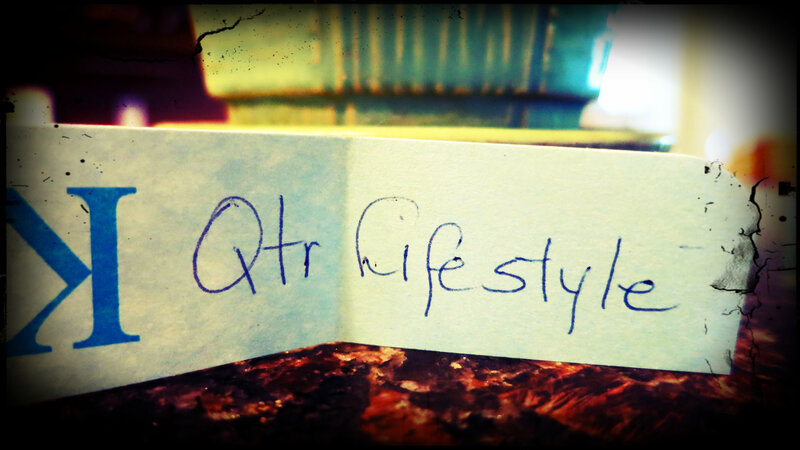 I’ll have to take a visit to Quarter Acre Lifestyle … how lucky they are to have an original Boomdee! Enjoyed reading all the comments, too, especially the 1am call to Mr. B. Oops!!! AWESOME costume Boom, I just saw Alys’s Amy pumpkin. You two are just quite the duo- you should get married and move to BC. Husbands can visit on holidays. haha Funny girls you are. I am so delighted that quarter acre won your beautiful house. I’ll bet they’ll look at it like I do the bucket of fun I have. Makes me smile every time. I bought treats but my son worked late so I had planned to sit outside with the neighbors. None in sight nor kids. I think the big bang swooped by and blasted them all into a new orbit. My son took what I didn’t eat, 😦 to work on Monday and got it out of my line of sight. I must say you make a much prettier Amy and not so dour in your expression. You can pull of the dress, just not the attitude. You are way too cheerful. I wish I could have joined you at the scrap-booking party. That looked like so much fun, just not coming home at 1 a.m. I’d have to spend the night. 🙂 My daughter said there were maybe 15-20 at my house but I missed it all this year. I can’t even imagine 150!!!! Good thing there were 2 of you there. You picked a good neighborhood. So happy for you! Hugs. Hello my dear, aren’t you a ray of sunshine to still be smiling about a gift from months ago, Thanks so much, I’m excited to be sending the little haunted house to New Zealand. October was a ton of fun even though it was pretty crazy busy. Amy is such a terrific character, the shows that she’s in make me laugh the most. Did you see the one where she plays a harp and sing, “everybody hurts sometime” ? With her dead pan sullenness, I still laugh to think about it. But thank you for saying such nice things. 150 is nothing, I think Alys said she had 270 or there a bouts…that’s really banana’s We are really happy here too Marlene. You know how it is to finally feel like you’re in the right place. Home is where your heart is but also a place to call your own. Hugs to you too. LOL, what a bummer that no one ventured into your feeding pen…..errrr I mean secured doggie compound. I wonder if it’d make a diff if they were dressed as a table? Maybe he’d just climb on up there and ride along like the Queen of Sheba. Really happy and excited to have a give away go around the world. Wendy and Roger have such a charming looking place. Have you gotten to visit? It seems like you’d be very close but probably not really. It’s quite an feat to be self sustaining, I applaud you all. Halloween looks like it was fun in your neighbourhood! 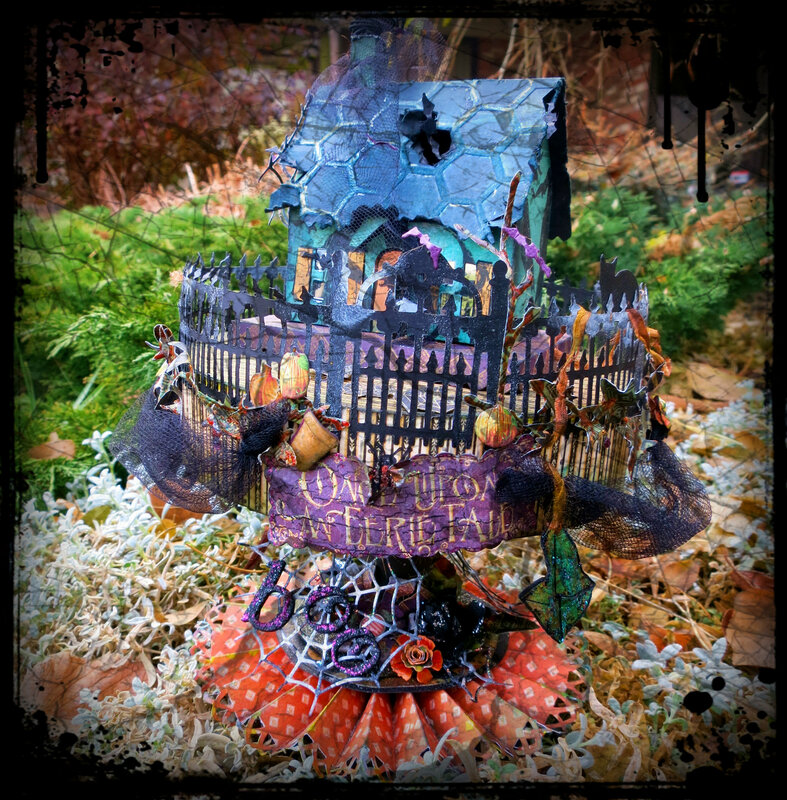 Lovely that your little Halloween house is heading to Wendy who is a great crafter of beautiful things, too. It really was fun this year in our new home. Almost every porch was decorated with pumpkins and lights and other decor. I had a ton of cobweb stretched everywhere. Over plants, the mailbox, the railing, the pumpkins, even the chair. Now the fun part, peeling all that stringy/clingy stuff off, HA. I’m super happy to be sending it along to Wendy. I hope she won’t mind waiting for it. New Zealand being on the other side of the planet from me, LOL. I love decorating with those cobwebs. A couple of small bags stretch far and wide. It rained on Halloween so taking it down was a drippy affair. Mouse insisted I hold him so we did some of it together. Did you get yours down before more snow and rain? You must be as tuckered out as I am: decorating, handing out candy, making a costume, dressing up and then your long work shift. Good thing your adorable Amy wore sensible shoes. Your costume is perfect! Congratulations to the lucky contest winner. How fun to think of your lovely house traveling to the other side of the world. And speaking of lovely houses, it sounds like you moved into the perfect neighborhood. Lots of kids and neighbors putting out decorations. So much fun. No, I had to have some Butterfinger Cups left over to try. Butterfinger Cups! Sound yummy. I’ve had a couple of left overs but for the most part resisted pretty good. Well except for the night of the work party, oh ya! I won this cute little house?!!!! Lol, ooooh that is so cool Boomdee, thank you so much, I am rapt!!! I will email you….ta! Our “little corner of the world” is a paradise to me Boomdee 🙂 We have only just advertised quietly to board dogs, haven’t don any yet other than for friends. It would seem a nice wee job! Congrats to the winner! the photos are great as always! And what a lively account of your adventures! Thank you for your constant support and kind messages Johanna. I really look forward to your visits. Yes, lively is a good word to describe our weekend. Work, costumes, a lost purse, more treaters than I could imagine and actually some pretty fine weather for October in Alberta. This month, while normally grey and soggy, turned out to be cheery and warm. “Bazinga” as my boyfriend Sheldon would say. Hope you’re still enjoying a brilliant fall and winter hasn’t yet wandered by ! Hi Boomdee, my name is Amy and I found you through my friend Julia (Defeat Despair). What a beautiful site. Looks like you had a great Halloween. We did not have single trick or treater. We live in a rural area and our drive is 160 yards long so maybe that is why. 🙂 Take care and thanks for sharing. Oh hello Amy! Thank you so much for coming by and your generous message too! How lucky are we to both be friends of Julia? Did you know that I’ll be traveling with another dear friend to visit Julia this coming spring? We’re really excited and hope to see the Cherry trees in Washington blooming. I linked over to your FB page and saw your gorgeous wedding photo there. Were you a bride this summer? Congratulations to you both. I know what Halloween’s like when you live in a rural area. We actually moved into the city after 25 years of rural life ourselves and have only lived in this house since June. We’re loving the community vibe in this beautiful neighbourhood. The country lifestyle was really great when we were younger, but our priorities have changed. We now enjoy the cinema’s, resturaunts and being close to work so much. Come by any time to say hello or have a giggle. Very nice to meet you Amy! Wow, 150 kids! That is amazing. We got about 10. Maybe they were scared of my 16 year daughter who was dressed as “Miranda Sings”. (know her? google her! She’s hilarious.) What a fun giveaway. And love your costume – although on you it just looks cute, not nerdy. LOL, those lips would frighten most kids I think..she’s a riot. I didn’t know about her but Googled. Oh ya, 10 is more what we’d be used to. It was non-stop for a couple of hours, 3 or 4 kids at a time. Not nerdy enough? HA, well a girl can try. Believe me, I didn’t feel one bit cute. I dared to go without makeup or flat ironing my hair. Don’t laugh now, that is daring in my books 😀 Thanks for your kind comment though. I’ll send you my schedule Aunty and If you ever want to drop in,I’ll give you the royal tour xox LUL too! OH noooooo! Say it isn’t so, LOL. If everyone liked the same shows, there’d be no choices on the Tellee. I think they may be an aquired taste. They make me laugh like crazy, and in the plethera of Cop, CSI or Lawyer shows, their silliness seems refreshing to me. Did you have many kiddies to your newly refreshed porch? 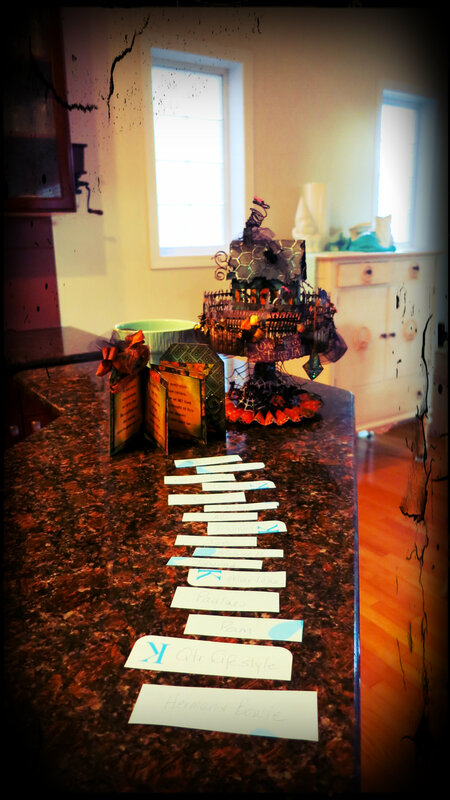 Congratulations to the lucky winners of your spooky and adorable haunted house! I’m sad it wasn’t ME, but glad someone will enjoy the fruit of your brilliant Halloween crafty mind NEXT year when they decorate their house! Love the pix of you and your coworkers – CLEVER costumes all……sounds like you really had a crowd at your house this year with trick or treaters. I think we had FIVE – maybe the FIVE you usually get came here????? Thanks so much for your cheery message Pam and Sam. I hope Qtr Acre will enjoy! The giant green sweater didn’t last too long, I had a far bit of running around to do and got too hot.